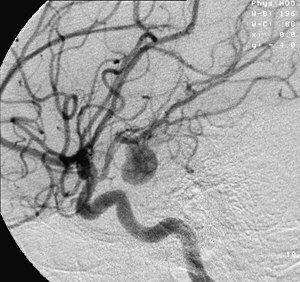 Angiografie o an aneurysm in a harn artery. The aneurysm is the bean-shaped object in the centre o the eemage. An aneurysm is a localised, bluid-filled balloon-lik bulge in the waw o a bluid veshel. This page wis last eeditit on 12 Februar 2018, at 17:41.